When operators of Canada’s largest entertainment complex needed event technology support for its hotels and conference center overlooking the Niagara Falls in Ontario, it was a sure bet they would partner with a company known for delivering exceptional results. That’s why Canadian Niagara Hotels Inc. selected PSAV® Presentation Services to manage the onsite audiovisual services for its Falls Avenue Resort, a mixed-use development comprised of 1,200 hotel rooms, 35 meeting rooms comprising 200,000 square feet of flexible meeting space, a 24-hour casino, a three-acre indoor Waterpark and wave pool, and 15 restaurants. This new partnership marks PSAV’s entrance into the Niagara Falls market in Canada. Qualify for Huge Discounts on Niagara’s Top Attractions! Earlier this week I received the latest email newsletter from the Clifton Hill Resort. Build Your Own Niagara Falls Adventure & Save Big! Book with Comfort Inn to qualify for DEEP discounts on Niagara’s best attractions. Its as easy as 1, 2, 3. Simply: 1) Select your dates 2) Pick a room type then 3) Select all the discount offers you want! Niagara’s Wettest Wonder. Get passes to Niagara’s newest and largest indoor waterpark and make a splash! SkyWheel, Movieland, XD Theater, Ghostblasters, Dino Adventure Golf or Galaxy Golf. + Bonus SkyWheel ride! Niagara Falls’ scariest & best haunted house attraction. They guarantee spine tingling entertainment & fun! Experience the art of illusion with Greg Frewin, one of the most decorated magicians in the world! Journey Behind the Falls, Butterfly Conservatory, Niagara’s Fury, 2 Day WEGO transportation pass. Book our Niagara Couples Getaway Package and add a FREE $50.00 Slot Play Voucher! Weekends only. – A hotel locaton walking distance to the Falls, Clifton Hill, Niagara Casinos, Niagara Parks & more! – Complimentary deluxe full breakfast buffet served in the Poolside Café. – Complimentary high speed WI-FI Internet available throughout the hotel. – Complimentary access to our oversized tropical indoor pool & Jacuzzi whirlpool. – Over $50 worth of discount coupons for attractions, entertainment, retail & more. Or please call our Reservations Office directly at 1-800-263-2557. 1 night accommodation in one of our spacious standard rooms. Children stay free, 18 and younger with an adult. Complimentary deluxe full breakfast buffet served in the Poolside Café. Complimentary access to our oversized tropical indoor pool and whirlpool. Complimentary high speed WI-FI Internet available throughout the hotel. Build-a-Package options for discounted attractions/entertainment when you book online. A perfect central location, steps to the Falls, Niagara Parks, Casino Niagara, and more! From ghost tours to nightclub mascarades, there’s plenty to do Halloween weekend in Niagara Falls. Click the options below for more details on some great Halloween weekend activities. You are currently subscribed to clifton-hill-resorts as graham@accessniagara.com. If you would like to update your E-Mail Settings, please do so here. Earlier this week I received the latest email newsletter from Falls Avenue. Family Winter Break and More! 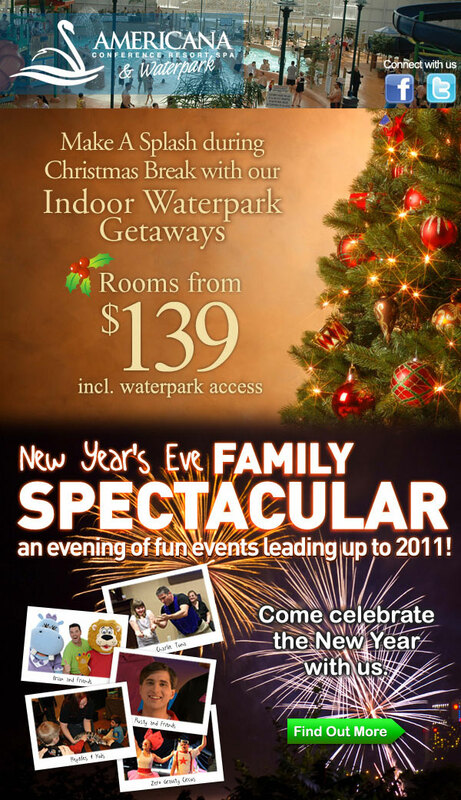 Last Wednesday I received the latest email newsletter from the Americana Waterpark Resort.